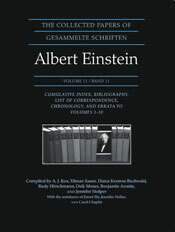 An invaluable research tool for delving into Einstein's written legacy; his interactions with colleagues, institutions, friends, and family; and his scientific, political, educational, and social activities, this volume provides quick access to the most authoritative compilation of documents and information concerning Einstein's work and correspondence for the first half of his life. It contains the first complete bibliography of Einstein's scientific and nonscientific writings until1921, and a succinct biographical time line. Cumulative Index to the first ten volumes of the collected papers, an exhaustive name and subject index. list all literature written by authors cited in at least one of the first ten volumes of the series. The indexes and bibliographies implicitly correct inconsistencies and errata across the different volumes. A List of Errata for the first ten volumes of the series.